As we are supported by wide distribution network and fastest transportation facilities, we deliver the orders on time. We stock our product for wholesale distribution and supply as we have state-of-the-art storage facility along with the most advanced inventory management system and upgraded machines. 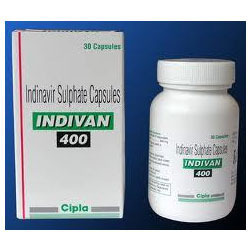 HIV infection, and can also be given in adjunctive therapy as an alternative drug of choice in Prophylaxis after occupational exposure to HIV. Indivan binds revers precursor polyproteins. As a result, immature viral particles incapable of infecting other cells are formed. Ibly to HIV-protease which prevents cleavage of the viral precursor polyproteins. As a result, immature viral particles incapable of infecting other cells are formed.